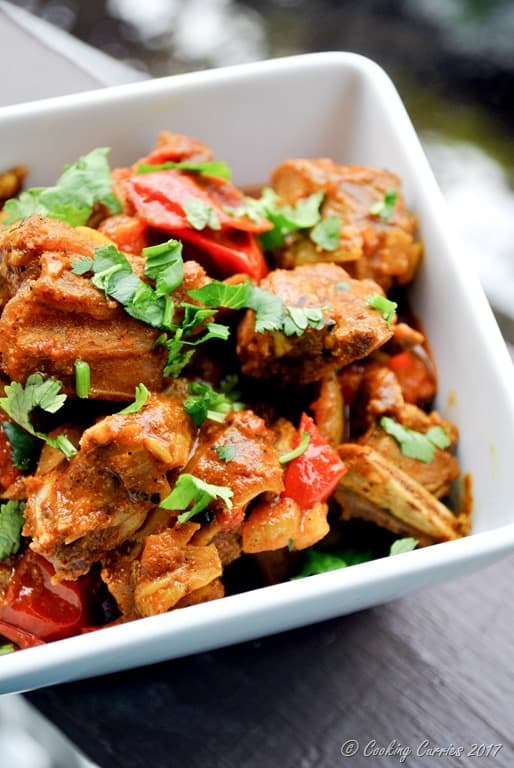 This deliciously spicy Kerala style preparation of Mutton Pepper Curry is a wonderful accompaniment to rotis, Malabar porottas or even plain rice! 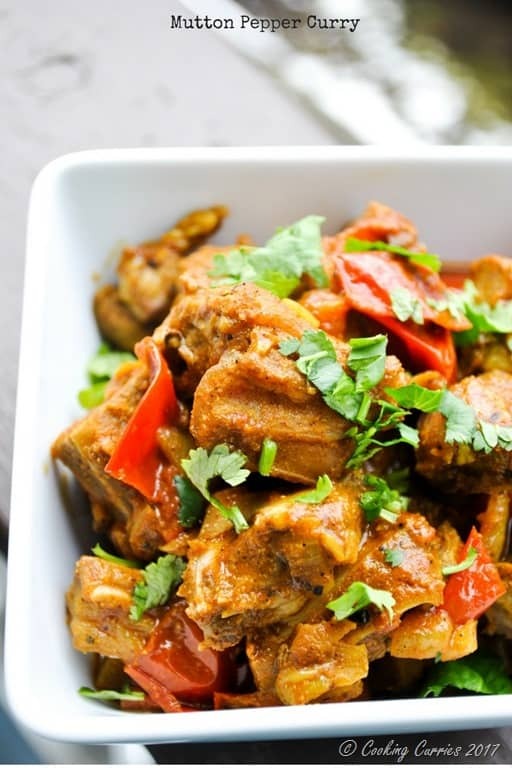 This mutton pepper curry is pretty easy to make and I have made it a few times at least, as the mutton that we get at the Indian store here is a giant frozen bag and even if I have people over, it is still a lot to make at one go. So most of the times, some of it goes back into the freezer to be used up later. This mutton that you get in the Indian stores is goat meat which is more popular in India and other parts of Asia. I am yet to see this in any of the other stores here. 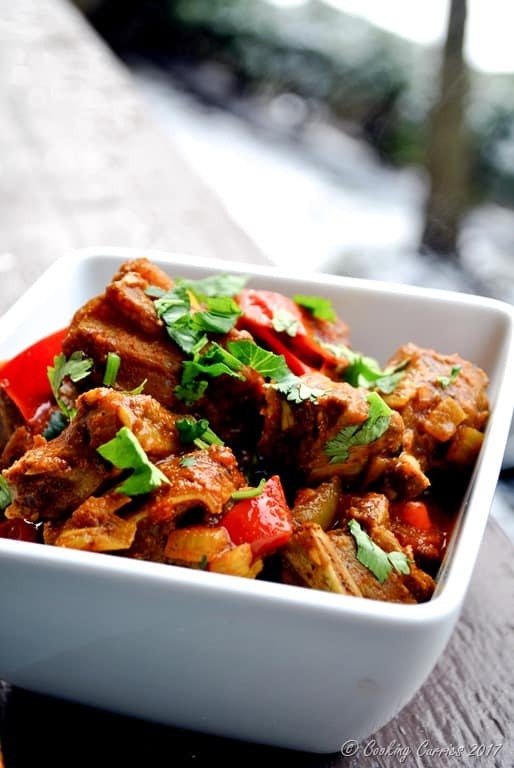 You can use lamb chunks cut up for stew instead of mutton, in this recipe but it wont necessarily be the same, as not all the fat is trimmed out and they are bone-in pieces as well. You could look for it in any Pakistani / Halal meat store. I made this mutton curry a really long time ago and I saw these pictures when I was cleaning out the food pictures in my computer a few days ago and thought I will post them here before I forget the recipe. And as I see this I remember that I’ve got to make this again real soon for my meat-a-holic, its been a while since we got any lamb / mutton and I made something with it. So here goes the recipe! Heat the oil in a large pan and add the curry leaves to it. Throw in the onions, green chillies ginger and garlic to it as well. Once the onions have softened, add all the spices to it (turmeric, coriander powder, cumin powder, black pepper and garam masala). Sauté well till the raw smell of turmeric goes away. Now add some water to just cover the meat in the pan. Cover and cook on medium high heat for a while till the meat is cooked well and almost falls off the bone. Once the water evaporates, take off the cover and increase the heat a little and sauté again so that it thickens up a little. Check seasoning and add some more black pepper for more heat or more salt if needed. Switch off heat and garnish with chopped cilantro. 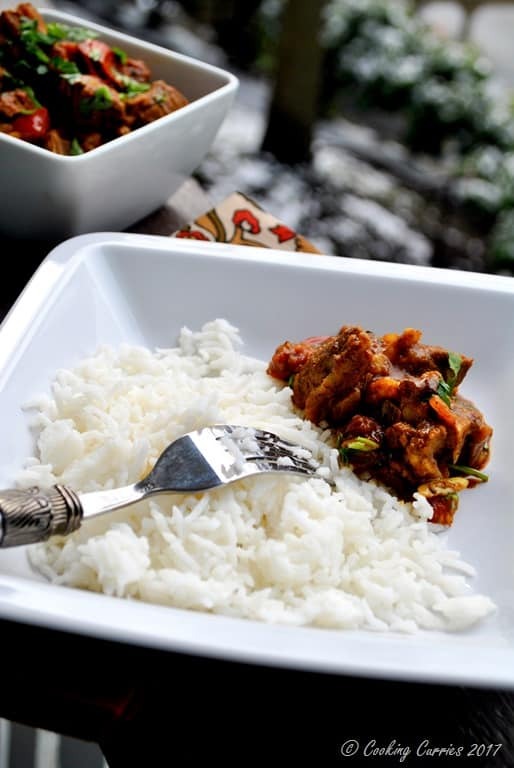 Serve with plain steamed white rice or rotis.